Eet je een weg door het centrum van San Antonio tijdens deze kleine groepswandeling voor eten en wandelen, een geweldige keuze voor bezoekers en voor fijnproevers. Sla met deze rondleiding de wachtlijst over en geniet van directe zitplaatsen in enkele van de beste restaurants van Alamo City. Proef klassieke Tex-Mex, authentieke Creools en meer. Tussen proeverijen door, krijg een kijkje achter de schermen in de eetcultuur van San Antonio en leer meer over het rijke culturele erfgoed van de stad. We thought that for the price of the food tour, we felt that there wasnt enough value. The samples were small. We have taken 5 other foodie tours in various cities as a comparison. Perhaps at one restaurant, the tour company can give everyone a nice beverage. A foodie tour in New Orleans did this. Or do one more stop. The guide was good and helpful. Great way to experience the city! 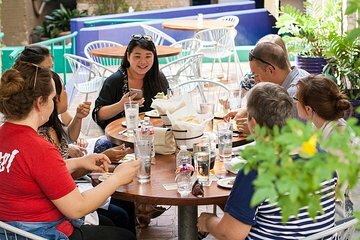 This tour was more of a history of San Antonio and an introduction to San Antonio's diverse food culture. I really loved Panaderia and their freshly out of oven-baked goods brought out by the owner who explained the history and the baking process. I didn't care for a creme brulee from a French bakery owned by French immigrant who loves San Antonio. Although I loved the story, I can get creme brulee anywhere and I wanted a something more of a local item, something I can only get in San Antonio. We visited 5 locations pulled pork bun, pastry, special taco, creme brulee, and guacamole, but since the portion size was small, I wasn't full at the end. For the same price, I enjoyed Taste San Antonio Food Tour better. You do however, learn a lot about the history of San Antonio and walk off the calories. It was nice the tour guide provided us the water bottle in the beginning. Was disappointed in the amount of food provided. Had a lot of fun but not worth the money for the taste of food you get. The bakery was amazing and the only place you get a real portion of food. This tour was wonderful! There was a variety of food options Cuban sandwich, street tacos, pan dulce, hand made guacamole, iced popsicle treats. All the food was excellent. We were full after the tour and just had some snacks back at the hotel for dinner. The walk was fairly long, but, the pace was good. Our guide, Jordan, was young but friendly and knowledgeable. All-in-all, I would highly recommend taking this tour. This was an amazing food tour! Mike was great. He was enthusiastic. We were in a group of 13 but it did not feel that big. He took us to places the locals go, which is what we were looking for. Easily walkable. Each place was better than the previous one. During our walk from restaurant to restaurant, Mike gave us local history about the buildings we passed. Mike is one of the reasons my girlfriend and I fell in love with San Antonio! This food tour was fun, satisfying especially in the selection and quantity of food sampling and well worth the effort. Our guide, Kevin, was friendly and anxious to please. Highly recommended! Kevin is a great friendly, knowledgeable, and seemed to be an all around good guy.I have already recommended this tour to friends we had a real good time and not only did we get to meet new people, eat great food at places we have never seen before, we also got some exercise. We live in Texas and have been to San Antonio many times without the knowledge of what great food was offered in that part of town. Anyway, this is worth trying out. This was a great way to learn about SA and taste some excellent dishes. I especially liked that it wasn't all about the Riverwalk restaurants because there's so much more to downtown to see and taste. Janelle was an excellent guide with a great personality and fun spirit. A lot of fun - easy walk through downtown San Antonio w/ stops at terrific restaurants, a bakery and a light dessert venue. Good info from the guide, as well, and made several new friends! I'd recommend this to anyone with 3 hours to spare and a desire to see behind the proverbial curtain a little bit at these eateries. Great event!